Are you ready for some boating fun? Dust off your sunglasses and break out the sunscreen, Freedom Boat Club is heading out for a day on the water! 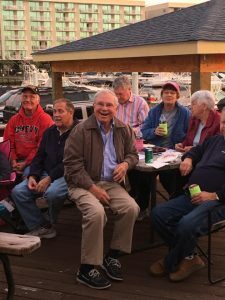 We will depart from the Freedom Boat Club at Harbourgate Marina in North Myrtle Beach at 10:30am for an exciting Member Boat Trip to The Boat House Waterway Bar and Grill where we will have lunch and then return around 3pm. Freedom Boat Club will provide beer, soda and water for the boat ride there and back as well as appetizers for the group to share at the restaurant. Members will be responsible for a share of the fuel and your lunch. Reservations are sure to fill up fast! Special thanks to fellow FBC member and fishing club participant, John Deyo, for giving Stew the lead on Jodie. Reminder: The Fishing Club will be fishing March 25th out of the Freedom Boat Club at the Southport Marina. Stew is taking signups for that day so if you are interested email him at fbcfishingclub@gmail.com. Members: If you are not on the FBC Fishing Club email list, but want to be, just shoot Stew an email at fbcfishingclub@gmail.com and he will add you.